With growing number of internet businesses, the battle to win customers’ attention has never been as competitive as it is today. As businesses are utilizing different tools to reach out to their target audiences in the most efficient way, more and more marketers agree that the success of these efforts is highly dependent on personalizing the communication. And that is when personalized marketing steps into the spotlight. How to use different data to personalize your marketing efforts? Personalized marketing is a communication strategy by which companies aim to deliver individualized content to each consumer, based on his behavior and expectations. To do that, companies have to collect data, analyze it and use a set of different automation technologies. The digital world is overloaded with information. It is known that an average internet user is presented with more than 1,707 banner ads per month. And the average number of emails sent and delivered per day is around 269 billion. Not to mention the number of blog posts and videos published daily. In order to cut through the digital noise, companies have to look for ways to be heard, noticed and remembered. And one of the most effective ways to do that is to personalize your marketing efforts. But what exactly can personalized marketing do for your business? Engagement can mean a lot of different things, and each brand has its own unique formula that defines engagement and how it is expected to work. However, usually, the goal of engagement is to create more chances for a user to interact with a brand. And eventually become a customer. Many businesses have fallen into the habit of communicating to masses and overlooking the most important asset of successful communication – personalization. Personalized content can make the website visitor come back to the site. Or stick around for longer because the user is able to find exactly what interests him. According to studies, 75% of customers are more willing to buy from a company that is able to recognize and recommend products or services that match their individual interests. Thanks to well-tailored offers or product recommendations, customers are able to discover items or piece of information that are most relevant to them. And it goes without saying that such discoveries appeal to individual tastes and inspire to take a plunge faster. Communication personalization is known as one of the best ways to build customer loyalty. Customers want to feel that you care about them. And that is exactly what personalized marketing aims to attain. Let the existing and prospective customers know that you are paying attention to them and genuinely care about their needs. When done correctly, personalized recommendations, greetings or special offers can result in a positive emotional experience that customer associates with a certain product or the brand itself. Over time, customer grows to trust the brand and develops a habit to shop from that particular store. The success of personalized marketing efforts is highly dependent on the products or services of your business. Keeping buyers’ journey in mind is not less important, though. There are numerous ways you can use different data to personalize your marketing efforts accordingly. And here are the few most popular. Most websites require user registration to complete the purchase or access exclusive content. Every user that completes the registration usually shares some of their personal information: email address, name, age, location. According to a number of studies conducted, including the recipient’s name in the email subject line can increase open rates up to 42%. Including user’s first name in the email is a good start. But that really isn’t the only way to personalize your communication with a customer. If you know the birth date of the user, don’t forget to congratulate him on his birthday. And if you can, give him a little “present” to prove that you really care. Let it be a discount code or valuable content. Another useful piece of information about your customers is their purchase history. And there are a number of ways you can use it to personalize future communication efforts. Of course, reaching out to every customer individually is not a solution. That’s why you should look into solutions that would help you automate a process of personalized communication. And most commonly, businesses choose to deliver individualized messages through emails and browser push notifications. Let’s take a look at a couple of different approaches how previous purchases can help you personalize your marketing efforts. Your online beauty store is running a special promotion for loyal customers of a certain brand. Reach out to only those customers who have purchased goods of that particular brand. Don’t forget to think about the life cycle of the product or service that has been purchased. Try to estimate the next time your customer might need the same or similar type of product or service. And once that time is approaching, remind customers about yourself. Imagine you own an online zoo store. Your client has purchased a pack of dog food. The chances are he will be in a need of it again in a few months time. Well, that’s your chance to prove that you care about him (and his pet). Why not send a friendly reminder? Surely the four-legged friend is looking forward to his next portion of the delicious dog food you sell in your online store. Also, think about complimentary products/services that your customer could benefit from. Let’s assume your customer has booked a flight and it’s coming up. It’s a great chance to cross-sell him an airport transfer that would save him time at the airport. Onsite behavior of the visitor gives you valuable information about what particularly interests him. Formulate and deliver relevant messages to each individual based on product category he looks through and on which pages of the website he has spent most of the time. You probably have seen “You May Also Like” section below the fold of many e-commerce websites. It’s a common practice by which stores are trying to prolong visitor’s stay on the site by cross-selling him similar type or style of products. But that’s not the only way you can show visitors that you care about their interests. Another effective onsite solution to prove customers that you pay attention would be using exit intent popups. Even though a lot of marketers have contrasting opinions about this tool, no one can deny that exit intent overlays are effective. And the effectiveness of this tool is mostly dependent on how well targeted the overlays are. If you show the same overlay to every incoming visitor, the odds to convert him are slim. However, if you target the overlay to appear on specific pages only and after a certain amount of time you are more likely to succeed. Let’s say you own a vehicle rental business. On your website visitors can choose different types of vehicles they are interested in renting. From scooters to trucks and limos. Now imagine you are running a special promotion for camper vans. As the selection of available vehicles is so great, you should present an overlay with your offer only to those visitors who are visiting this particular category of vehicles. Whichever strategy you will decide to implement, keep in mind that there’s a thin line between being welcoming and appearing creepy. Certain businesses can allow themselves be more depending on the audience. Others have to be very careful with a data to not scare both existing and prospective customer. One more tool worth mentioning is web push notifications. It’s one of the highest converting marketing channels out there that can significantly increase sales for online businesses. Most of its success in communication with user depends on remarkable flexibility in content personalization. Alongside URL targeting, which already gives a wide angle on content personalization, web push takes to another level with API integration. Push notification API allows you to create personal messages and automated their delivery. Remind user about expiring services, recover abandoned carts, invite to the event, encourage new purchases from a beloved brand or offer complementary services based on their buyer’s journey. The more personal, the better. Of course, don’t forget your mailing list. 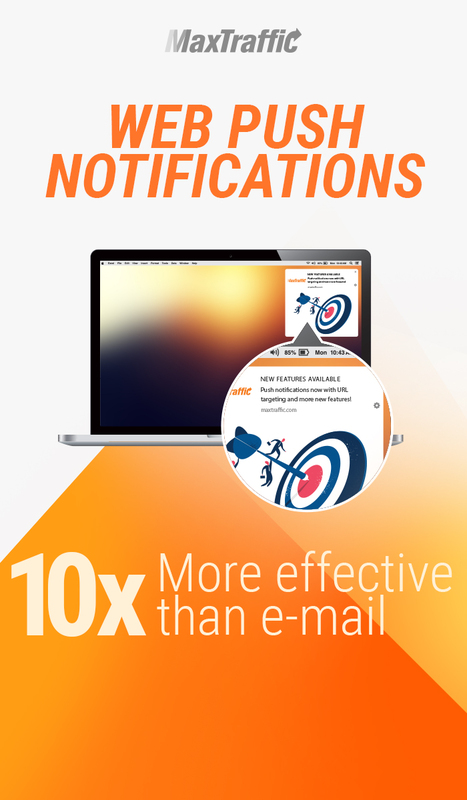 Even though emails comparing to web push notifications have lower conversion rates, they are still an inseparable part of marketing communications. And yes, email campaigns can be automated and personalized too. According to email marketing predictions for 2018, email marketing automation is something every marketer should utilize better sooner than later as the importance of delivering the right content to each customer at the right time is only going to grow. It’s fair to say that most of us are used to receiving occasional emails that announce sales, present product recommendations or special offers. But that’s not the only way to maintain a personal connection with the customers. Online text editor and grammar checker Grammarly delivers users their weekly writing updates, quite often showering them with compliments. Even though as a recipient you understand that these emails are automated, seeing the weekly results with friendly encouragement is pleasant. By analyzing onsite behavior of many different visitors, you are likely to notice certain behavioral patterns. Use this knowledge to match users with items they could potentially be interested in as such items have proved to be loved by other users that have similar interests. Most people are followers. They are more keen on choosing a product or service that is liked by others first. That’s why you should occasionally inform users about “Best Selling”, “Most Popular” or “Back in Stock” items. Amazon is taking the approach of matching users to potentially interesting items for them seriously. Quite often it offers to consider other products which have been popular amongst other shoppers, mentioning that “Customers who bought this item also bought”. Other times, Amazon suggests customers purchase a set of items (“Frequently bought together”) that are related and have been previously purchased together by other shoppers. In the world of internet business, it would be simply unacceptable not to mention social media communication personalization. Today 7 in 10 people use social media to connect with others, engage with various types of content, share information or entertain themselves. It’s fair to say that the whole point of being on social media is to increase brand awareness and build a personal connection with existing and prospective clients. And to achieve that, carefully respond to received messages or comments left on your profile. Also, react to mentions – positive or negative. All this effort will pay off, as users will understand that you are present and care about their opinions and experiences. The goal of personalized marketing is to truly engage users by communicating with each of them as an individual. Mix and match different data to provide a better experience for the customer. But don’t forget to keep the balance between “We thought this might be interesting for you” and “We are watching you”. With that being said, carefully study gathered data, develop a strategy and test before you dive into the wide waters of personalization.